When my family and I were in New Orleans last November, we took the St. Charles Streetcar to the Garden District, famous for beautiful Victorian houses. And while I did indeed see beautiful houses and character filled above-ground cemeteries, this might have been my most usual and amusing photo. 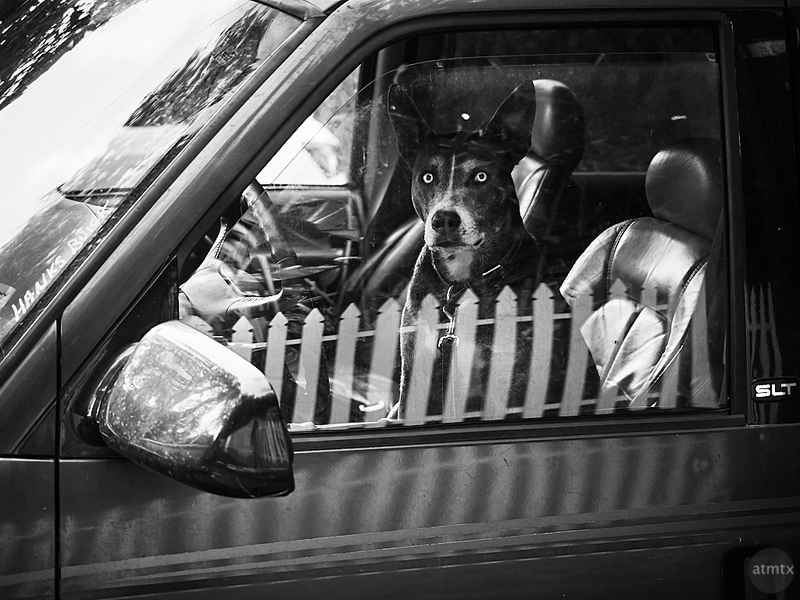 Along one of the neighborhood streets filled will grand Victorians, each one more impressive than the next, I saw this dog, sitting in the driver’s seat, alone. The dog’s expression, with the small pupils, makes him looks guilty of something. Perhaps he was driving without a license. The picket fence is courtesy of a reflection from a nearby Victorian beauty, which adds another level of interest and absurdity to the photograph. I was thinking Erwitt, too. Not when I took the picture, but afterwards, after post-processing.